Workplace Gallery is delighted to announce the opening of our first solo exhibition by Tanya Axford. Tanya Axford’s recent works are derived from her interest in the intersections between Performance, Sculpture and Video. In two new installation works, Axford explores the intangible outcomes of material properties under specific temporal and situational conditions. 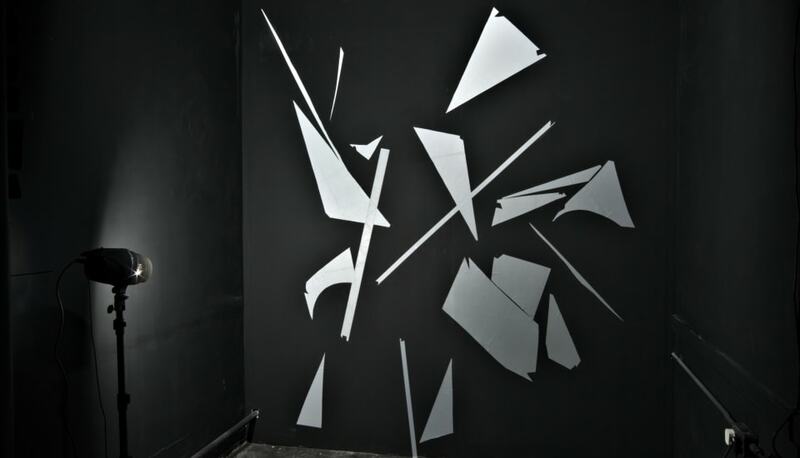 In Choose or Hoard for the Future, a geometric Vorticist style collage of highly reflective fabric has been assembled directly onto the wall of a pitch-black space. Illuminated only for a microsecond by an array of synchronised slave camera-flashes the college is experienced an ocular memory literally burnt into the retina; visually understood through accumulated exposure. The work is effectively constructed inside the mind of the viewer through a layering of randomly timed and fleeting moments that are interspersed and intensified with the high-frequency whine of the charging flash. Feel That is a five-channel video installation comprised of looped close-up video vignettes of metallic foil attached to a slowly rotating motor which causes the foil to gather and twist, constantly expanding and contracting from the loose membrane into compact sculptural form, on the and out again. Projected by a series of hanging mini LED projectors onto roughly torn and crumpled paper hiding speaker cones resting on the floor. This work explores the contingent qualities of its own material dynamics to produce a hypnotic and entropic glimmer of light and a combined hissing and crackling sonic colloquy. Axford’s work investigates the manipulation and behaviour of both the subject and the viewer. Through combining a reductive palette with specifically controlled conditions this work operates as an open-ended experiment leading the viewer into an experiential and immersive dialogue with the work as it occurs; both as passive onlooker and as implicit participant. Axford’s work investigates the manipulation and behaviour of both the subject and the viewer. Through combining a reductive palette with specifically controlled conditions this work operates as an open-ended experiment leading the viewer into an experiential and immersive dialogue with the work as it occurs; both as passive onlooker and as implicit participant.